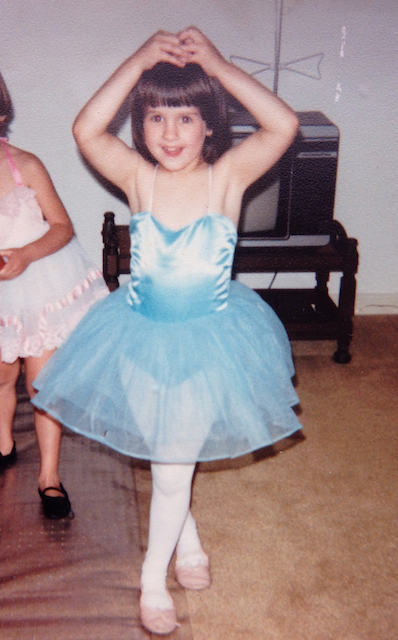 At the age of four I was brimming with excitement as I thought about the rapid approach of my first dance performance. The ballet was Alice in Wonderland and I was one of the talking flowers. Soon I would be up on stage, dancing alongside the older girls, and I was awestruck at the thought. I ran my fingers tenderly across the costume before I tried it on. The leotard was smooth and shiny, pale blue satin. The tutu was layer upon layer of tulle in the same soft blue. The outfit was completed with white tights and pale pink ballet slippers. It was the most beautiful thing I’d ever worn and I felt an electrifying tingle of wonder as I tried it on for the first time. I couldn’t imagine anything more lovely than that costume. Mom looked me over and shook her head at the sight of the thin straps digging into the flesh around my shoulders. I was tall for my age and my long torso didn’t quite fit into the leotard. I watched soberly as mom cut off the pretty blue straps and replaced them with a thin stretchy white elastic band. Yet even this alteration to the perfection of the costume couldn’t dampen its beauty in my eyes. Later, as my baby sister napped in the quiet hours before the dress rehearsal, I found a pair of scissors and began to cut several small holes in the tutu. I remember thinking that real flowers sometimes had holes in their leaves and I wanted my costume to be more realistic. When my mother found me, she was dismayed but decided that the holes weren’t noticeable enough to be seen from the audience. We were soon on our way to the venue and the experience of being in the ballet was dreamy. I floated through the dress rehearsal and performance, soaking in the beauty of it all and willing myself to remember every moment. As I reflect on that four year old, I smile at her reverent wonder at the simple beauty of the blue satin leotard, her joy in being caught up in the thrill of the ballet. And I am amused by her concern for making the costume more realistic. I’d obviously spent enough time examining the flowers in our garden to know that real flowers were beautiful but also came with holes chewed in their leaves by hungry caterpillars. The memory makes me wince a bit as well, as I take note of the elements of this story which foreshadow other experiences in my life. Four years old and already becoming aware that my body didn’t fit the standard measurements. Four years old and already fighting the tension between what I longed for and the sometimes difficult reality of the world I lived in. I wish I could give that little four year old a hug and shelter her from the storms that were brewing on the horizon. Thirteen years later I would stand in front of a mirror again, this time in a different satin gown. It was a deep burgundy and the long skirt floated just above the floor. The day of my senior prom had arrived. By the end of high school a stoic realism had already won out over youthful desire in my heart. Dreams of becoming a dancer, artist or musician had been replaced with more practical and responsible plans. So as I slipped on my gown that day I was surprised to feel a little tingle of hope rise up in me, an echo of what my four year old heart had once felt in the blue tutu. Sadly that night my lovely girlish dreams would shatter quietly as my date left me at the door of the prom venue and never once asked me to dance. The hope that had begun to blossom anew withered away. I scolded myself for daring to believe that I could be desirable. I hated the part of me that wanted to be beautiful, to be danced with, to be held, because it made me vulnerable to being deeply hurt. As an adult I find myself still pulled in two directions. Part of me carefully steels itself against feeling the sting of disappointment I felt that night at prom. Something in me whispers that it is too dangerous to let my heart desire deeply and scans the horizon for possible threats. Yet, against all odds, my heart often continues to beat with the same longing that welled up in me at age 4. I am not content to live hiding behind the perceived safety of my self-protective strategies. I want to be the kind of woman who risks engaging desire, even knowing that my heart will be opened to the sting of pain and loss. I want to have the courage to offer my heart in relationship, even though past experiences might make it feel foolish to do so. In spite of all the risks involved, I want to dance with freedom, hope and joy—like the little girl in the blue tutu did so many years ago. 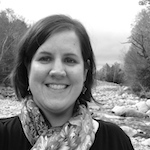 Elizabeth Pennock is a 30-something single woman who delights in mountain streams, cobblestone streets, hip-hop dancing, and porch swings. She spent her 20s residing in Eastern Europe but currently lives in Orlando, Florida, where she works as a mental health therapist & soul care provider. She is currently taking a sabbatical from the ministry she has worked with for the past 12 years and is treasuring this unique season of rest, while also having fun learning to play the piano for the first time in her life. You are beautiful. I love you, my friend. Beautiful! Thanks for risking to share that with us. Beautiful! You and this article. Thanks for sharing it and your life. Appreciate your transparency and honesty. I’ve had similar experiences, glad He was always with me, even if I forgot that in the pain. Blessings. Captivating. You pull me to more beauty and vulnerability. Love you lady! “Yet, against all odds, my heart often continues to beat with the same longing that welled up in me at age 4.” I hear your awareness that longing and desire are incredibly risky, and still worth fighting for. Thank you for your beautiful story – the girl in the blue tutu and the young woman in the burgundy dress are both lovely reminders of hope.